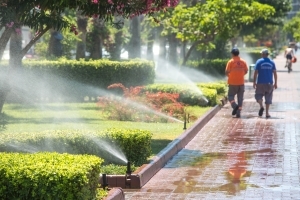 Katy Sprinkler Repair specializes in residential and commercial sprinkler systems, and no matter the time of year, we provide maintenance for your lawn irrigation system. Our trained and licensed technicians are ready to professionally address your sprinkler issues. Our work speaks for itself. rewarding because we know we contribute to the beauty in our area. lawn at the mercy of rain storms will quickly turn it brown and unattractive. the beauty of the lawn. None of that could be possible without a properly operating sprinkler system. We often receive calls from homeowners and business owners for irrigation repair. lawn by allowing it to suffer under the hot Texas sun. many other sprinkler repair companies won’t repair, it isn’t a problem for us. our teens go to Faith West Academy and KHS (GO Katy Tigers!). We dine at Perry’s Steakhouse & Grille and LaCenterra at Cinco Ranch. Überrito Mexican Grill La Centerra and our bellies confirm it. Of course, we also enjoy spending time playing golf at Meadow Brook Farms Golf Club and The Club at Falcon Point. do it in a way that makes people comfortable and satisfied. a call to schedule a time for us to come out to your home or office. We’ll be glad to help. Since 1999, Katy Sprinkler Repair has offered outstanding residential sprinkler repair services. Every homeowner who invested in a sprinkler system knows the value to the health and beauty of their yard. They also know maintenance and repair are inevitable requirements. Equipment ages, breaks, leaks form from cracks in piping, or how easy it is to cut the grass and clip a sprinkler head. Our full crew of skilled technicians is ready and waiting to tackle any sprinkler repair you may present. As our technicians are equipped with the latest tools and training, we make repairs look easy. One call to Katy Sprinkler Repair and your landscape will be fixed to flourish! Every business owner knows any commercial property with a pristine landscape, sets the initial impression of customer or future tenant alike. Any number of simple maintenance issues could jeopardize that first good impression. But a call to Katy Sprinkler Repair will set us in motion, to fix that wayward sprinkler system, and restore your lawn to lustrous health. First impressions are simple to ensure, so hard to repair. To Katy Sprinkler Repair, your local business is our local business, so let us ensure your property’s sprinkler system is functioning correctly. Call us to fix the problem while we suggest you take a break at our town’s treasure Cavanaugh Flight Museum or plan an outing at Historical Downtown Katy with a fun day for the family. Katy Sprinkler Repair promotes its business on providing premium sprinkler repair throughout the Katy area for homeowners and commercial property owners. Our reputation precedes us for being passionate at delivering high-quality service, taking that extra step to prevent potential problems, and all at affordable pricing. Scheduling a licensed technician is easy and our team works efficiently to resolve your problem as timely as possible. ▪Sprinkler spray heads are set down, not spraying above the grass line. ▪Controller box or timer does not work properly because of poor wiring, a bad battery, or a faulty zone valve. If you suspect a leak or some other issue, call us right away. We will come to inspect your system, locate the source of the problem, and fix it quickly. Put our specialists at Katy Sprinkler Repair to work for you, and get the resolution done the right way. When you spend time in the yard, you will need adequate outdoor lighting to illuminate and enjoy your landscape. If you are entertaining family and friends after dark, then exquisite lighting is preferred. A deck or patio need not be neglected after dark with outdoor lighting available. After a long day at work, the soft ambiance of light on a deck, patio or pool is rather relaxing, wouldn’t you agree? Be sure to install LED yard lighting, which is less likely to attract mosquitoes than incandescent lights. And finally, outdoor lighting enhances the appeal, beauty, and value of your home. Everyone notices a house accented in elegant light, come nightfall. It renders the home like a piece of art, don’t you think? Katy Sprinkler Repair will start the process by walking the property with you, detailing all the landscape features and areas that need proper lighting. Our estimate is free and we have a variety of high quality lighting fixtures to choose from. Rest assured, our professional team of technicians are trained in the product specifications for all of the fixtures we supply, including all electrical installation techniques. As such, we adhere to all the safety compliance standards for both residential and commercial lighting design. Once installed, we offer Service Checkups to ensure everything is working correctly. Regardless of the purpose, there are many positive benefits to having outdoor lighting. From implementing safety and security to adding style and beauty, outdoor lighting offers both aesthetic and functional benefits to your home. Call our lighting design experts, and we’ll meet with you to determine which outdoor lighting products will best meet your needs and help transform your yard into a beautiful, secure place.